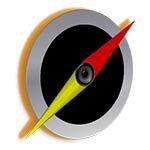 Free Download GPS Waypoints Navigator Apk for Android from revdl . 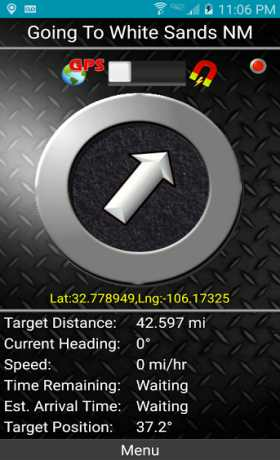 Convert your phone into the most powerful GPS for Android Powered Devices with GPS Waypoints Navigator, now the world’s most sought-after smart phone navigation aide. With dozens of options for navigating the back-country, waterways and roadways, the tool set found in this software package will quickly become your best friend. Venture beyond network reach using offline maps and tools that only require a good view of the sky. Share important location data with friends who will be able to navigate to your favorite waypoints and find your favorite trails. Get:★ Waypoint and Trail Management Systems. ★ KML file importing and exporting for trails and waypoints. Your exported data will be viewable and navigable on your friend’s devices and in Google Earth. ★ Email a map of your position. Navigation software not required on recipient’s device. ★ Different GUI ‘s to choose from. ★ Altitude determined from your position matched to altitude values in land survey databases providing you with values that are more reliable than altitude values returned from your device’s GPS chip. – Turn-by-turn driving directions and driving maps. 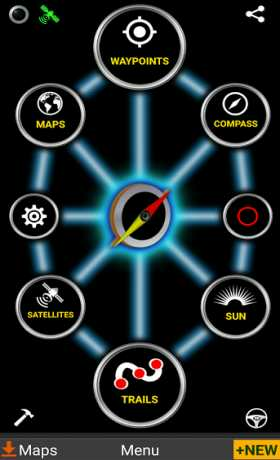 – You decide how compasses are controlled- By GPS or magnetically. Use magnetic control for indoors, underground or in caves. – Supports multiple languages: English, Spanish, German, Portuguese, Russian, Chinese (traditional and simplified). 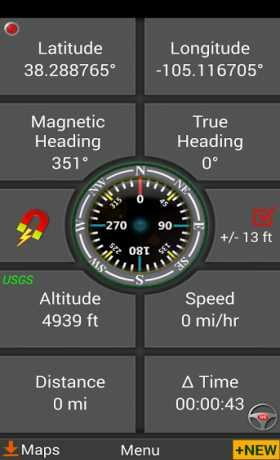 -Users now have the option to chose Satellite, United States Geologic Survey location based altitude or Mapquest’s Altitude Service for altitude reporting. USGS and Mapquest data are generally more accurate but require a network connection. USGS available only in contiguous U.S.A, Canada and Mexico.